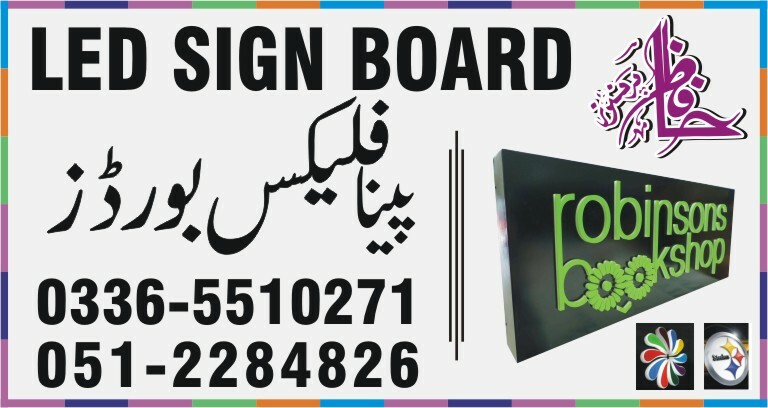 We Provide LED SIGN BOARD MAKERS Services in Islamabad, Pakistan. Very High Quality LED SIGN BOARD MAKERS Services In Low Prices. Replacement Graphic Panels, Roller Graphic Prints, Short-run business Literature Printing and many other printing. Doing more for less is like magic. Be productive and efficient by achieving more. We offer the most updated, superior range of product line in the large Solvent Printing industry. Most important thing to us is to meet your requirements and help you in any possible. You deserve our undivided commitment for customer and technical support. Solvent technology has advanced in the last few years resulting in high color graphics at resolutions up to 1440 dpi and their high UV resistance. With specialist media, you can expect up to 5 years durability outdoors. With the use of solvent printing we have the space and knowledge to promote large display campaigns.